“15See then that ye walk circumspectly, not as fools, but as wise, 16Redeeming the time, because the days are evil” (Ephesians 5:15,16, KJV). Brethren, we have work to do! We are living at the end of the age – at a time when knowledge is so widespread and bountiful, that the average person living in a Metropolitan area will be exposed to more knowledge and input in a week than an entire family of 100 years ago would be exposed to in a year. Ours is a time when communication is literally instant; we can see and hear someone on the other side of the world and fluently converse with them when 100 years ago that conversation would not even have been possible. Ours is a time when travel is so fast and so luxurious that it has made the entire earth navigable by an average individual whereas 100 years ago such travel would have taken months and great risk. Ours is a time when, for the 1st time in all of human history, leisure time is not only available to the masses, it is expected and it is often considered a human right. Entertainment is no longer an unattainable dream for many; it is now one of the world’s largest and most influential industries! Thus, we live in a time of distraction, temptation and selfish ambition. A time when personal discipline only applies when we feel like it and a time when integrity and absolutes have all but gone the way of the dinosaur. “15Therefore be careful how you walk, not as unwise men but as wise, 16making the most of your time, because the days are evil“ (Ephesians 5:15-16,NASB). What does it mean to make the most of our time? One would think that redeeming the time would be easier in this day of technological genius than ever before, but that is not the case, for with knowledge and technology come choices – lots and lots of choices, embedded in various shades of grey, all designed to capture our hearts and imaginations. So, my task today is clear – it is to suggest to you a practical plan and path to better serve our Lord and Master – at the expense of ourselves. We will suggest 6 basic principles to focus on and with each, attempt to relay some personal experiences of my own journey as I attempt to do what you are attempting to do – that is, to live selflessly, humbly and sacrificially unto death. This is based on my 14 year journey thus far, with Christian Questions. The word for redeem is only used 4 times in the New Testament. Twice it is in the context of our personal responsibility towards managing our time – our theme text and Colossians 4:5 and twice in the context of Jesus redeeming us from the curse of the Law and bringing us into the adoption of sons. Thus we can easily see the meaning as Christ nailed the Law to the cross and made it of none effect as it was now replaced with son-ship, we also are required to nail the world, the flesh and the devil and all their demands upon us to our cross and replace them with a clean slate of the only thing we have to offer our Lord in sacrifice – OUR WILL as expressed through how we spend our time. Remember what we just spoke about? With knowledge and technology come choices – lots and lots of choices, embedded in various shades of grey, all designed to capture our hearts and imaginations. So how do you find the vision that supersedes all these things? Thou shalt have “NO other gods before ME“ (Exodus 20:1-17). “A double minded man is unstable in all his ways” (James 1:8, KJV). This 1st commandment is one of internal application—it happens inside you. You decide in your heart and mind who or what your God is, and the result of that decision is played out in several of the other commandments. Focus hard on this! Be brutally honest with the mirror! Who is, what is my God. “No man can serve two masters: for either he will hate the one, and love the other; or else he will hold to the one, and despise the other. Ye cannot serve God and mammon” (Matthew 6:24, KJV). Imagine the quality of your thoughts when the Almighty is “true north”! “2Then the LORD answered me and said: Write the vision; make it plain on tablets, so that a runner may read it. 3For there is still a vision for the appointed time; it speaks of the end, and does not lie. If it seems to tarry, wait for it; it will surely come, it will not delay. 4Look at the proud! Their spirit is not right in them, but the righteous live by their faith” (Habakkuk 2:2-4, NRSV). KNOW YOUR VISION! You must HAVE Vision! “1Therefore, since we are surrounded by so great a cloud of witnesses, let us also lay aside every weight and the sin that clings so closely, and let us run with perseverance the race that is set before us, 2looking to Jesus the pioneer and perfecter of our faith, who for the sake of the joy that was set before him endured the cross, disregarding its shame, and has taken his seat at the right hand of the throne of God. 3Consider him who endured such hostility against himself from sinners, so that you may not grow weary or lose heart” (Hebrews 12:1-3, NRSV). Our vision is the big, panoramic picture of our passion and purpose. Priorities are the necessary ordering of the details of our life. “Husbands, love your wives” (Ephesians 5:25, NASB). “Fathers… bring them up in the discipline and instruction of the Lord“ (Ephesians 6:4, NASB). “But if anyone does not provide for his own, and especially for those of his household, he has denied the faith and is worse than an unbeliever” (1 Timothy 5:8, NASB). “… let us do good to all people” (Galatians 6:10, NASB). “Be diligent to present yourself approved to God as a workman who does not need to be ashamed, accurately handling the word of truth“ (2 Timothy 2:15, NASB). “This is My commandment, that you love one another, just as I have loved you” (Job 15:12, NASB). “Bear one another’s burdens, and thereby fulfill the law of Christ“ (Galatians 6:2, NASB). All of these and more, must, of necessity be melded together into a harmonious recipe for humble and focused service to the Glory of God! There is always another road to choose and there is always another internal battle to be fought. Armed with vision and priorities, we are able to choose rightly, even if our humanness would rather not. “For the flesh sets its desire against the Spirit, and the Spirit against the flesh; for these are in opposition to one another, so that you may not do the things that you please” (Galatians 5:17, NASB). “Meanwhile the disciples were urging Him, saying, “Rabbi, eat.”… 34Jesus said to them, “My food [my nourishment] is to do the will of Him who sent Me and to accomplish“ (John 4:31,34, NASB). “Pilate therefore said unto him, Art thou a king then? Jesus answered, Thou sayest that I am a king. To this end was I born, and for this cause came I into the world, that I should bear witness unto the truth. Every one that is of the truth heareth my voice“ (John 18:37, KJV). KNOW YOUR PRIORITIES – you MUST HAVE Priorities!! the right focus and activity! Br. Rick Suraci mentioned in his discourse that each radio broadcast hour represents about 8-10 hours of effort… two hours of radio per week… approximately 719 programs per year and counting… Generally, no weeks off… There is a priority to GET THE JOB DONE because the Lord has GIVEN US this opportunity, [a gift from the Heavenly Father]. We may not always get our priorities right the 1st time, but as long as our vision is strong we can reset! When we have truly established our priorities based on the big picture, there will naturally develop a deep sense of urgency, for nothing will be more important than following through on that which has proven to be most important! The secret for redeeming the time (which really is no secret at all) is to maintain urgency, and it is based on the 10th Commandment: Thou shalt NOT Covet. “You shall not covet your neighbor’s house; you shall not covet your neighbor’s wife, or his male servant, or his female servant, or his ox, or his donkey, or anything that is your neighbor’s” (Exodus 20:17, ESV). The 10th Commandment like the 1st is an internal commandment – no one can really know if you are living a covetous life because this takes place in the heart and mind. Coveting is expressed on the outside only when it is firmly rooted on the inside! “2Then the LORD answered me and said: Write the vision; make it plain on tablets, so that a runner may read it. 3For there is still a vision for the appointed time; it speaks of the end, and does not lie. If it seems to tarry, wait for it; it will surely come, it will not delay. 4Look at the proud! Their spirit is not right in them, but the righteous live by their faith (Habakkuk 2:2-4, NRSV). Urgently strain forward towards that which is most valuable! “12NOT that I have already obtained it or have already become perfect, but I PRESS ON so that I may lay hold of that for which also I was laid hold of by Christ Jesus. 13Brethren, I do not regard myself as having laid hold of it yet; but one thing I do: forgetting what lies behind and reaching forward to what lies ahead, 14I press on toward the goal for the prize of the upward call of God in Christ Jesus. 15Let us therefore, as many as are perfect, have this attitude; and if in anything you have a different attitude, God will reveal that also to you; 16however, let us keep living by that same standard to which we have attained“ (Philippians 3:12-16, NASB). “49I have come to cast fire upon the earth; and how I wish it were already kindled! 50But I have a baptism to undergo, and how distressed I am until it is accomplished!” (Luke 12:49-50, NASB). Success in sacrifice is most often born out of failure. To fail with great intention, over and over again is to live in the hand of God’s mercy – and that is success! Over years of Christian Questions Radio Program there were (and are) many, many times that the stress and strain of the responsibility are overwhelming – Not knowing what topic to work on next, not having time to develop a topic, Sunday night anxiety when expansion started and the format changed… What kept it always moving forward was the deadline – the urgency that the only thing that mattered was the next broadcast! What deadline do you have??? The 1st three steps are the necessary elements we must have in place to truly redeem our time. These next three things are the “how to” part of the equation. They represent what must be in place in our hearts and minds to back up and execute the vision, priorities and urgency we have chosen. Next comes inspiration. Inspiration is that which feeds and lifts the heart so that it may overcome. The secret for redeeming the time related to living an inspired life is to find those things which inspire your spiritual growth – drink them in! Inspiration works best when we have someone whose struggle can be observed. “7 So to keep me from becoming conceited because of the surpassing greatness of the revelations, a thorn was given me in the flesh, a messenger of Satan to harass me, to keep me from becoming conceited. 8 Three times I pleaded with the Lord about this, that it should leave me. 9 But he said to me, “My grace is sufficient for you, for my power is made perfect in weakness.” Therefore I will boast all the more gladly of my weaknesses, so that the power of Christ may rest upon me. 10 For the sake of Christ, then, I am content with weaknesses, insults, hardships, persecutions, and calamities. There are hundreds, perhaps thousands of Biblical accounts, promises and prophecies that we are at liberty to make our own, for the sake of inspiring us to redeem the time. And what about the lives of our own brethren? Look at who inspired the Apostle Paul. “For who is our hope or joy or crown of exultation? Is it not even YOU, in the presence of our Lord Jesus at His coming?” (1 Thessalonians 2:19, NASB). The Apostle Paul drew strength from his brethren – Can we not do the same Brethren?! “41So they removed the stone. Then Jesus raised His eyes, and said, “Father, I thank You that You have heard Me. 42“I knew that You always hear Me; but because of the people standing around I said it, so that they may believe that You sent Me” (John 11:41-42, NASB). Jesus exemplified to everyone there that his strength came from our Heavenly Father! We can only imagine the depth of Jesus’ inspiration, for he knew the Father, he knew the angels, he knew the prophecies and he knew his mission. Inspiration is not necessarily delivered in exhilaration and victory. On the contrary, it is often found in those lonely and desperate times of struggle, doubt and fear and it quietly carries you through your present tempest to where you can again find secure footing. Prayers, support and accountability of the brethren. Perspiration is the result of the continuous exertion that stems from being fully engaged. “6Therefore humble yourselves under the mighty hand of God, that He may exalt you at the proper time, 7casting all your anxiety on Him, because He cares for you” (1 Peter 5:6-7, NASB). “8Be of sober spirit, be on the alert. Your adversary, the devil, prowls around like a roaring lion, seeking someone to devour. 9But resist him, firm in your faith, knowing that the same experiences of suffering are being accomplished by your brethren who are in the world” (1 Peter 5:6-7, NASB). We hear the adage – work smarter not harder and this is true, yet for the New Creation we are to work smarter that is through the spirit – and therefore be able to work harder and more productively at those things of greatest importance. Why would we be willing to sweat? “7But whatever things were gain to me, those things I have counted as loss for the sake of Christ. 8More than that, I count all things to be loss in view of the surpassing value of knowing Christ Jesus my Lord, for whom I have suffered the loss of all things, and count them but rubbish so that I may gain Christ, 9and may be found in Him, not having a righteousness of my own derived from the Law, but that which is through faith in Christ, the righteousness which comes from God on the basis of faith, 10that I may know Him and the power of His resurrection and the fellowship of His sufferings, being conformed to His death; 11in order that I may attain to the resurrection from the dead“ (Philippians 3:7-11, NASB). “41And He withdrew from them about a stone’s throw, and He knelt down and began to pray, 42saying, ‘Father, if You are willing, remove this cup from Me; yet not My will, but Yours be done.’ 43Now an angel from heaven appeared to Him, strengthening Him. 44And being in agony He was praying very fervently; and His sweat became like drops of blood, falling down upon the ground. 45When He rose from prayer, He came to the disciples and found them sleeping from sorrow, 46and said to them, ‘Why are you sleeping? Get up and pray that you may not enter into temptation’” (Luke 22:41-46, NASB). The more fully engaged we are in the work, the more we find that the greatest effort is often not the work itself, rather it is the effort to position and condition ourselves for that work. We all have perceived limits of what we are capable of giving in service. IF we lay those limits at the feet of the Lord, He may, IF WE ARE WILLING, stretch our perceived capacity a little at a time so we can stretch our perceived limits to be more in line with our actual potential. BE ENGAGED! With the perspiration of complete engagement in place, there remains but one thing to give a complete picture of redeeming our time. It is a simple thing, yet often overlooked when we set our minds to a service. It is consistency. Consistency is the continual long term application of all those things necessary towards faithfulness. Never give in, never give in, never, never, never, never give in!!! “Do not fear what you are about to suffer. Behold, the devil is about to cast some of you into prison, so that you will be tested, and you will have tribulation for ten days. Be faithful until death, and I will give you the crown of life” (Revelation 2:10, NASB). How do we check ourselves to be sure that we are consistently following the right path, the right thoughts, the right attitudes and the right actions? “4Rejoice IN the Lord always; again I will say, rejoice! 5Let your gentle spirit be known to all men. The Lord is near. 6Be anxious for nothing, but in everything by prayer and supplication with thanksgiving let your requests be made known to God. 7And the peace of God, which surpasses all comprehension, will guard your hearts and your minds in Christ Jesus. 8Finally, brethren, whatever is true, whatever is honorable, whatever is right, whatever is pure, whatever is lovely, whatever is of good repute, if there is any excellence and if anything worthy of praise, dwell on these things” (Philippians 4:4-8, NASB). “28And one of the scribes came, and having heard them reasoning together, and perceiving that he had answered them well, asked him, Which is the first commandment of all? 29And Jesus answered him, The first of all the commandments is, Hear, O Israel; The Lord our God is one Lord: 30And thou shalt love the Lord thy God with all thy heart, and with all thy soul, and with all thy mind, and with all thy strength: this is the first commandment. 31And the second is like, namely this, Thou shalt love thy neighbour as thyself. There is none other commandment greater than these” (Mark 12:28-31, KJV). Consistency in an effort, is perhaps the least glamorous of all its elements. There is no excitement of an idea, no newness of a project, no giddy anticipation of a beginning. Consistency shines in the quiet times of monotony, in the bruised moments of failure and in the darkness, when the unknown and unsung perseverance of will beckons us to get up one more time and press on by the GRACE [unmerited favor, undeserved kindness] of GOD! Opportunity can present themselves to us when we mentally make room for them. “18But someone may will say, ‘You have faith and I have works; show me your faith without the works, and I will show you my faith by my works.’ 19You believe that God is one. You do well; the demons also believe, and shudder. 20But are you willing to recognize, you foolish fellow, that faith without works is useless? '” (James 2:18-20, NASB). “(20) Though the Lord may give you the bread of adversity and the water of affliction, yet your Teacher will not hide himself any more, but your eyes shall see your Teacher. (21) And when you turn to the right or when you turn to the left, your ears shall hear a word behind you, saying, ‘This is the way; walk in it'” (Isaiah 30:20-21, NRSV). Opportunities can be accepted when we spiritually make room for them. “4For the weapons of our warfare are not of the flesh, but divinely powerful for the destruction of fortresses. 5We are destroying speculations and every lofty thing raised up against the knowledge of God, and we are taking every thought captive to the obedience of Christ” (2 Corinthians 10:4-5, NASB). Opportunities can flourish when we prayerfully feed and nurture them. “16Rejoice always; 17pray without ceasing; 18in everything give thanks; for this is God’s will for you in Christ Jesus. 19Do not quench the Spirit; 20do not despise prophetic utterances. 21But examine everything carefully; hold fast to that which is good; 22abstain from every form of evil” (1 Thessalonians 5:16-22, NASB). 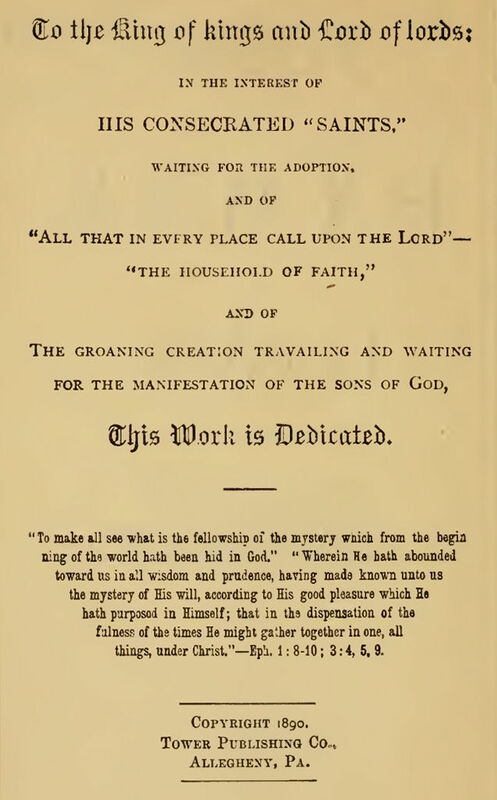 A transcription of the below video from a willing, Beloved IN CHRIST, volunteer contributor (which helped to form this post) is another reason for this post and so may it be said “Thank YOU Beloved Brothers and Sisters IN CHRIST for YOUR labours of LOVE IN CHRIST.” May our Heavenly Father’s bless and keep you HIS, according to HIS perfect WILL, until by GOD’s GRACE, we are with our Heavenly Father, Jehovah, and His Son—our Head, Christ Jesus. “Come to me, all who labor and are heavy laden, and I will give you rest. 29 Take my yoke upon you, and learn from me, for I am gentle and lowly in heart, and you will find rest for your souls. 30 For my yoke is easy, and my burden is light” (Matthew 11:28-30, ESV). Original Author – Stephen of Mar Sabas (725-794); also titled as Stephen the Sabaite. Composer – No information available. Br. Charles Taze Russell—the founder of the Bible Students movement, who is the compiler of “Poems and Hymns of Millennial Dawn” which was published in Allegheny, Pa., U.S.A. in 1890. This Bible Students’ devotional contained a total of 151 poems and 333 hymns. And always in His Son rejoice.